I have always been one of those women who does not like to fuss over how I look. This aspect of me drove my mother absolutely crazy because she was such a fashionista. Mom would never leave the house unless she had on full make up, hair done, crisply ironed pants and an elegant blouse. Me on the other hand, would rather wear a sundress, little or no makeup, and sandals. Little did I know I was wearing a huge fashion trend called bohemian chic. This laid back style may be low on fuss but not on character and looks. If you prefer a casual yet fashionable look, you should follow these tips! Hair: To get the boho chic look for your hair, natural is the way to go. If you have curly or wavy hair, wear it loose and let that gorgeous texture show! Also, braids and Afros are very big in the bohemian look. Makeup: The boho tradition calls for a natural look with minimal makeup. If you can go organic, that is even better. A light foundation or powder with light earth tones for the eyes and a pale pink or just a gloss on the lips is perfect. Accessories: More is better when it comes to accessories for the boho chic look. Lots of mis-matched bangles, chunky bracelets, long earrings, ankle bracelets, and toe rings are a must! Clothing: If you want to know how to look boho chic look, it is all about looking very natural and unique. Earthy tones are most popular, especially clothes with splashes orange, green, and magenta. The skirts and dresses are flowy and feminine, but they do not need to be baggy. Cut off shorts, washed and faded jeans, tie dye and patchwork is very popular. One of my favorite clothing and accessory stores which is rich in the boho chic look is Hip Mountain Mama. I first fell in love with this mom and pop store when I reviewed one of their tops almost two years ago. I love how well made their clothing is, how incredibly comfortable they are and the selection is quite good. Suzy started this company in 2008 and she is committed to selling products that are made in the USA or Fair Trade in India or Nepal. I just admire her for her strive to bring women of all ages clothing and accessories that make them feel and look beautiful without a bunch of pretense! She is a gal right after my own heart! I wanted a few cute summer things for Caitlin to wear and because she is so into the bohemian chic look, I knew we would find some great stuff from Suzy. We chose the Orange Blossom Dress, which sells for $37 on the Hip Mountain Mama website. This classic boho chic dress has an sweet handkerchief cut at the bottom, is light, and flows beautifully. The pretty earthy hues in the tie dye fits in with the boho chic look perfectly. I love that you can wear the adjustable straps over the shoulders and tied through the loops in the back or tied around the neck. We also chose the cute Summer Patch Tank, which you can find on the website for $25. 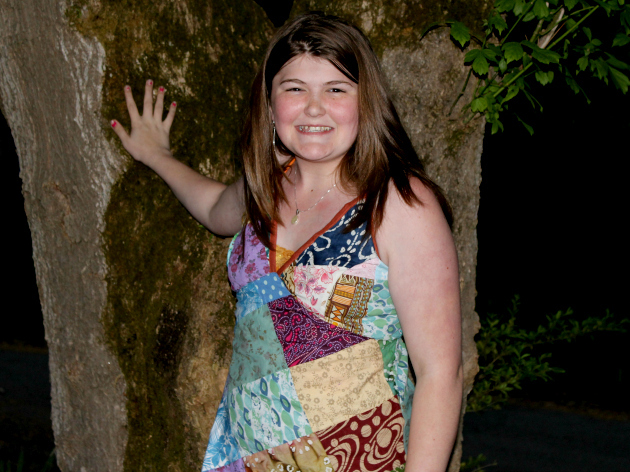 It has colorful calico patches and has the same adjustable straps as the dress. The top looks perfect with a pair of cute cut off jean shorts, leggings, skinny jeans or a skirt. Hip Mountain Mama also has clothing and accessories for men and kids as well as jewelry, incense, decor and more. Be sure to stay current with Hip Mountain Mama and follow her on Twitter and Youtube. One USA reader will win a $50 Hip Mountain Mama GC at the Makobi Scribe Mother’s Day Gift ideas event! Which Hip Mountain Mama item would complete your boho chic look?